TALLINN – An Estonian Language House, meant to become a center of activity for people whose native language is not Estonian to learn and practice Estonian and to participate in Estonian culture more broadly, opened in the capital of Estonia on Wednesday. The institution located at the central Tallinn address of 5 Ravala Avenue offers an integrated service for learning the language and integration. It organizes and coordinates learning of the Estonian language, offers practical possibilities for obtaining fluency in the Estonian language and use of the language, as well as comprehensive information about integration. The house also brings together and shares methodological know-how related to the learning of the language. The Estonian Language House was declared open by ringing of the inaugural school bell, a tour of the building and inspirational speeches. During the opening event, television cameraman Mustafa Celik, comedian Stewart Johnson and startup entrepreneur Evgenia Trofimova put their command of Estonian to the test in a speed talk competition, the Integration Foundation said. The head of the Integration Foundation, Irene Kaosaar, said that everybody whose native language is other than Estonian is awaited in the Estonian Language House regardless of their ethnic background or language skills to learn, practice or just listen to Estonian language speech and thereby settle in faster. 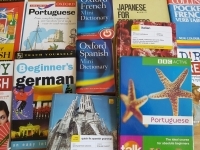 "The Estonian Language House is a place where those who wish can get advice, support and practice the language, which is the basis for finding a common language and a mental space between people of different ethnic backgrounds and native languages," Kaosaar said. The minister of culture, Indrek Saar, said that every speaker of the Estonian language is an important and valuable bearer of our culture. "The number of speakers of our beautiful language doesn't have to be limited to those who live in Estonia. The goal should be bigger, why not set the idea put into words by one of the heads of the Estonian Institute, Mart Meri -- the dream to increase the number of speakers of the Estonian language to 1.5 million people worldwide -- as the next big goal," the minister said. The manager of the Estonian Language House of Tallinn, Olga Selistseva, said that the Estonian Language House definitely will not restrict itself to the formal function of language learning. "Many of the people who have come to live in Estonia have passive command of the Estonian language, and it is our goal to offer these people as extensive opportunities as possible to practice the Estonian language. We are planning to organize language cafes, tandem learning and different events that enable language skills to develop fastest," Selistseva said. She said the Estonian Language House also expects people for whom Estonian is first language to come and learn some other language by means of tandem learning. In addition to the Estonian Language House in Tallinn, the Estonian Language House in the northeastern border city of Narva is set to open on new premises this year. The Estonian Language Houses are organized by the Integration Foundation and their activity is financed with money from the European Social Fund and by the Estonian Ministry of Culture.